No other location can offer you such an amazing backdrop for your intimate wedding or elopement. Walk out your front door and discover stunning views, secluded private hideaways in the woods and numerous hiking trails within a stone’s throw of our mountaintop inn. These beautiful trails range from simple strolls to challenging climbs on our 250 acres or in the Great Smoky Mountain National Park, which is our next door neighbor! 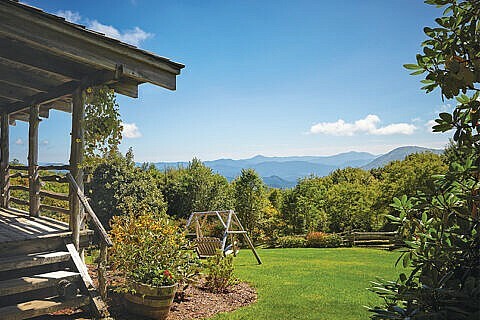 Sink into a hammock together or soak in the hot tub while you gaze out over four of North Carolina’s six highest mountain ranges. Many of our rooms have private balconies, stone fireplaces, soaking tubs or spa tubs and steam showers for the ultimate romantic experience. *Call for more information on pricing. Once your dates are chosen and you have booked your two night stay we will help you locate local vendors for your NC elopement or intimate wedding including; your wedding officiant, wedding cake, flowers, string music, photography or videography. Select from our many romantic rooms and suites and create a wedding to remember. To order an elopements package please contact our Guest Services office at (828) 926-0430 or (800) 789-7672 to discuss your options.